If you purchased a condo, and your HOA ask you for a flooring system to achieve IIC rating of 70. We can help you meet this requirement with our cork flooring and cork underlay. To achieve your HOA requirements 70dB, first you need find out what your building construction is: wood frame? 2.5”, 6”, 8” concrete slab? It would be very difficult to achieve STC 70 without knowing what your building already sits at. You can download supporting documents here and provide to your HOA. 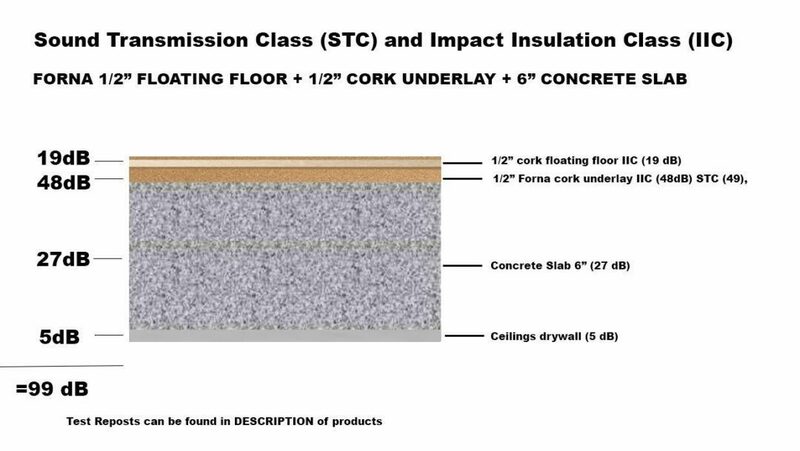 1/2″ (12mm) cork underlayment IIC STC statement. 1/4″ (6mm) cork underlayment IIC STC statement. 1/8″ (3mm) cork underlayment IIC STC statement. 1/2″ (12mm) cork floating IIC report. Add 1/2″ (12mm) cork floating flooring that has 22 dB. Add 1/2″ (12mm) cork floating flooring that has 22dB. Add 1/2″ (12mm) coating floating flooring that has 22dB. The easiest way to achieve this is to SHOW the board what ½” cork underlay + ½” cork flooring LOOKS like. The samples we offer have impressed every condo board we have had the pleasure of working with. And, for the record, carpet doesn’t have a ‘rating’. The pad has the rating. A low end carpet pad offers very little to the acoustic value of the carpet. And THAT is your BIGGEST argument! Carpet does very LITTLE for STC ratings. It only works on IIC ratings (footfalls) and even then it is the carpet PAD that does all the work. You will have a great argument if you have a “bad” carpet with a THIN pad. You can argue that the cork underlay (1/4″ (6mm) cork underlay) + 1/2″ (12mm) cork floating floor would do MORE for airborne noise than the existing “bad” carpet. You would be replacing a “bad” material with a much BETTER material. We have been successful getting a cork solution into condos. We have successfully helped condo dwellers achieve a cork floating floor in buildings that would otherwise turn down anything other than carpet. The first thing you will need to find would be the requirements for your building. HOA or condo boards will have documents that state the by-laws. The by-laws should provide the STC/IIC rating. When it comes to sound insulation, cork ranks #2 in the world. It is second only to SOLID RUBBER. Solid rubber is not to be confused with “foam rubber” which is what is what most underlay on the market is made from. Foam rubber is nothing better than a thick plastic bag. Cork and cork underlayment have some of the best numbers (sound rating and thermal insulation) in the industry. Our 12mm (1/2 inch) cork underlayment ($1.49/sf) is worth the same as 8mm (5/8 inch) of solid rubber underlayment ($10-$20/sf). As thermal insulation, it is equal to 2 inches of solid Styrofoam insulation (the stuff on the outside of a house to keep it warm = $4-$8/sf).